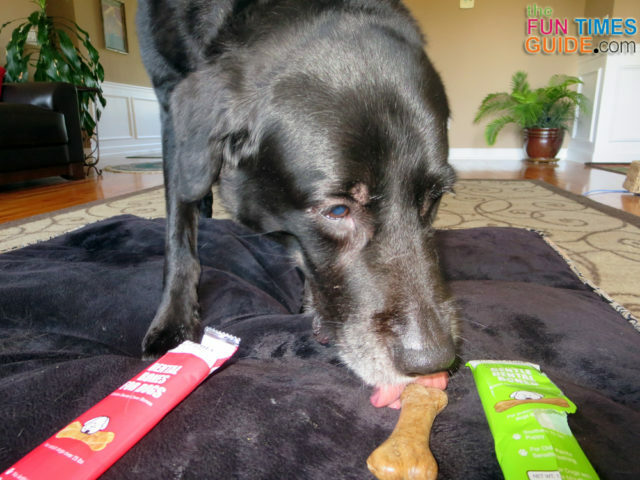 I’ve heard good things about Mercola healthy pet products, but haven’t tried them… til now. In fact, ever since my dog started taking Glucosamine and Chondroitin after tearing his ACL, I’ve considered trying the Mercola supplements instead of buying them from Costco. 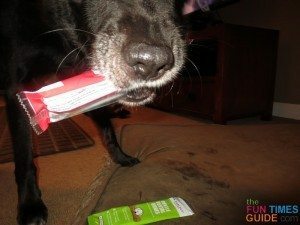 When the folks at Mercola Healthy Pets asked if I’d be interested in reviewing their dog dental bones, I was excited to try them (or rather, let my dog try them) because I truly respect the veterinarians behind Mercola pet products. I was eager to see if their products are the high quality that I would expect them to be. My dog, Tenor, is an 8-year-old 100 lb Labrador / Pyrenees mix. While I give my dog a lot of treats, they’re rationed out in a day and broken into smaller pieces rather than served whole. He doesn’t get a lot of “special” treats. And no human food. On top of that, he’s rather picky. For instance, he won’t touch Milk Bones — America’s favorite dog treats. Or Nylabone toys & treats — also classic favorites. So I was anxious to see if he would like the Mercola Dental Bones or not. After receiving 1 box each of Dental Bones for large dogs and Gentle Dental Bones for puppies and older dogs, I decided to make one of each available to my dog (at the same time) to see which one he preferred — just by sight and smell alone. 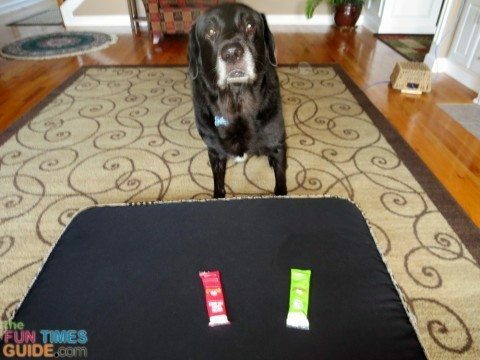 Almost every time, he chose the larger Dental Bone (red wrapper) over the smaller Gentle Dental Bone (green wrapper). At first I thought it was due to the stronger aroma, but now I’m thinking… He’s not stupid. He knows that bigger is better! They smell practically identical. His excitement for these dog treats has continued. Each time he gets one, it’s as if it’s the first time he’s tasting it — a truly enjoyable experience for my dog. Made in the USA… not China! USDA certified organic brown rice is the #1 ingredient. No saturated fats or transfats. No allergens like corn gluten or soy. No artificial colors, flavors, or chemical preservatives. Extremely aromatic, so they’re eagerly anticipated by my dog. Contain cinnamon, helpful for toothaches, bad breath, better digestive function. Long shelf life, since each bone is individually wrapped. The boxes I received have a “use by” date that’s nearly 2 years away! Since the Gentle Dental Bones are softer than the regular Dental Bones (they’re actually a little bit chewy), they aren’t as likely to break into large hard chunks as the regular Dental Bones are. The dog’s teeth can easily break the Gentle Bones down into smaller bite-size pieces, so there’s no fear of choking. They’re somewhat expensive at $2 apiece. They don’t last very long. My dog finishes a large Dental Bone in barely 10 minutes and a Gentle Dental Bone in less than 5 minutes. I get a little nervous listening and watching as my dog’s powerful jaws crack off large chunks of the large Dental Bone. The parts he’s breaking off are quite big. And he sometimes swallows those pieces whole. Granted, he’s a large dog so he takes big bites — and can handle larger bites than smaller dogs — but we are trained as pet parents not to let our dogs swallow large, hard pieces of anything. Since the Mercola Dental Bones are all-natural and easily digestible, I don’t worry after he’s swallowed ’em. But I watch him like a hawk until he does. Mercola Healthy Pets Dental Bones Are Dog-Approved! Everything I do with my dog — or give my dog — I assign a name to it. The Mercola Healthy Pets Dental Bones are known as “treat bones” to my dog. Just say the word, and he comes running! In fact, the first few times I gave him these dog chew bones, I left the wrapper on the floor near him and watched to see what he would do. He immediately wanted to play with the wrappers — even long after the bones were gone. That’s a sure sign that he really liked the smell and the flavor. My dog definitely likes his Mercola treat bones! I will continue to buy them as a special (rare) treat for him.